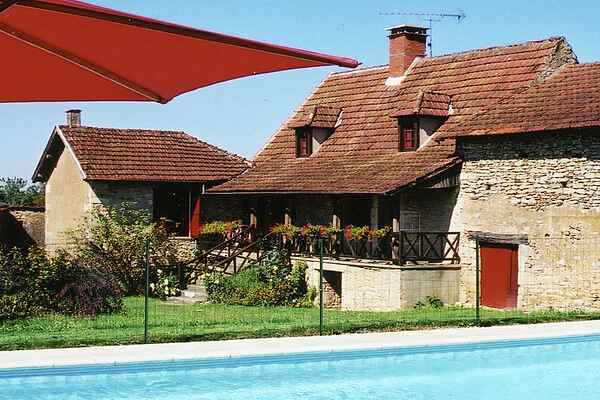 This holiday home lies in a wonderful location near Besse (1 km). At the rear of the house you can walk straight into surrounding woodland. At the front there is a wonderful garden, with a swing for the children and a great, private swimming pool. Take the stairs via the covered veranda and you will find yourself in one of the lovely bedrooms of this 15th Century house. Through the second bedroom you have access to a third closet-bed. In Besse you can find a lovely old chapel and just 6 kilometres away lies ancient Villefranche-du-Périgord. Here you can shop to your heart's content. You will find many historical monuments but, of course, lots of lovely terraces too. Although you have an outstanding, private swimming pool, it is also nice to go swimming in the wild. Near Prats-du-Périgord (6 km) is a gorgeous swimming lake. Art lovers can head to the Zadkine-museum in Les Arques (19 km). Just a little further away from Besse are lots of other possibilities for great day trips. We can heartily recommend the castle at Bonaguil (24 km) and the lovely spots of Monpazier (26 km), Belvès (30 km) and Domme (28 km).